I have worked for the past 5 years to get out of debt, pay my bills, and own a home. I'm glad to say that all my debts are paid off, my bills are paid every month, and my mortgage is cut by 10 years time, since I pay a little extra toward it. I have an emergency fund of approximately 4 months saved up, and have investments if that turns out to not be enough. I'm saving for retirement through the company pension, as well as with an outside organization, so I believe I will be comfortable in my retirement years. I'm under 30, and have 15 years of a 25 year mortgage left, at 2.89%. My credit card is paid off every month, and I use cash for everything I can. My goal is to get my house paid off, but I'm feeling that the interest rate is low enough that it should be one of the last things on my mind. Should I try to build more of an emergency fund, pay more down on my mortgage, or try to get some more investments in my name? This is a 15 year span, containing what was arguably one of the most awful decades going. A full 10 year period with a negative return. 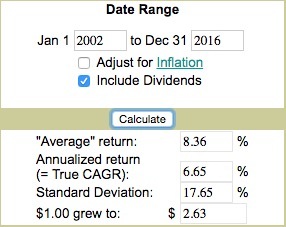 Yet, the 15 year return was a 6.65% CAGR. You'd net 5.65% after long term cap gains. Your mortgage is likely costing ~4% or 3% after tax (This is not applicable to my Canadian friends, I understand you don't deduct interest). In my not so humble opinion, I'd pay off the highest rate debts first (unlike The David followers who are happy to pay off tens of thousands of dollars in 0% interest debt before the large 18% debt) and invest at the highest rate I'd get long term. The problem is knowing when to flip from one to the other. Here's food for thought - The David insists on his use of the 12% long term market return. The last 100 years have had an average 11.96% return, but you can't spend average, the CAGR, the real compound rate was 10.06%. Why would he recommend paying off a sub 3% loan while using 12% for his long term planning (All my David remarks are not applicable to Canadian members, you all probably know better than to listen to US entertainers)? I am retired, and put my money where my mouth is. The $200K I still owe on my mortgage is offset by over $400K in my 401(k). The money went in at 25%/28% pretax, has grown over these past 20 years, and comes out at 15% to pay my mortgage each month. No regrets. Anyone starting out now, and taking a 30 year mortgage, but putting the delta to a 15 year mortgage payment into their 401(k) is nearly certain to have far more in the retirement account 15 years hence than their remaining balance on the loan, even after taxes are considered. Even more if this money helps them to get the full matching, which too many miss. All that said, keep in mind, the market is likely to see a correction or two in the next 15 years, one of which may be painful. If that would keep you up at night, don't listen to me. If a fixed return of 4% seems more appealing than a 10% return with a 15% standard deviation, pay the mortgage first. Last - if you have a paid off house but no job, the town still wants its property tax, and the utilities still need to be paid. If you lose your job with $400K in your 401(k)/IRA but have a $200K mortgage, you have a lot of time to find a new job or sell the house with little pressure from the debt collectors. You're putting plenty away for retirement, awesome! Others who read this should plan on 10-15% for that. The big bonus here is the tax advantage that comes from lowering your taxable income. Consider what portion of your salary is being taxed at a higher marginal rate. All of that money has an (often quite large) immediate return through lower taxes. Keep putting money aside for your short-term savings until you have 6 months. Save up for other major purchases you see on the horizon so you don't need to go into debt for them. Pay down the house. It will feel so good when you know you have a place to stay whatever else comes in your life. This seems to be a very emotional thing for people and there are a lot of conflicting answers. I agree with JoeTaxpayer in general but I think it's worth coming at it from a slightly different angle. You are in Canada and you don't get to deduct anything for your mortgage interest like in the US, so that simplifies things a bit. The next thing to consider is that in an amortized mortgage, the later payments include increasingly more principal. This matters because the extra payments you make earlier in the loan have much more impact on reducing your interest than those made at the end of the loan. You have paid off the house. You owe $50K and have $50K in a bank account. If you do the math, you'll see that the total is the same in both scenarios. Nominally, $50K of equity is worth the same as $50K in the bank. "But wait!" you protest, "what about the interest on the loan?" For sure, you likely won't get 2.89% on money in a bank account in this environment. But there's a big difference between money in the bank and equity in your house: you can't withdraw part of your equity. You either have to sell the house (which takes time) or you have to take out a loan against your equity which is likely going to be more expensive than your current loan. This is the basic reasoning behind the advice to have a certain period of time covered. 4 months isn't terrible but you could have more of a cushion. Consider things like upcoming maintenance or improvements on the house. Are you going to need a new roof before you move? New driveway or landscape improvements? Having enough cash to make a down-payment on your next home can be a huge advantage because you can make a non-contingent offer which will often be accepted at a lower value than a contingent offer. By putting this money into your home equity, you essentially make it inaccessible and there's an opportunity cost to that. You will also earn exact 0% on that equity. The only benefit you get is to reduce a loan which is charging you a tiny rate that you are unlikely to get again any time soon. I would take that extra cash and build more cushion. I would also put as much money into any tax sheltered investments as you can. You should expect to earn more than 2.89% on your long-term investments. You really aren't in debt as far as the house goes as long as you are not underwater on the loan: the net value of that asset is positive on your balance sheet. Yes you need to keep making payments but a big account balance covers that. In fact if you hit on hard times and you've put all your extra cash into equity, you might ironically not being able to make your payments and lose the home. One thing I just realized is that since you are in Canada, you probably don't have a fixed-rate on your mortgage. A variable-rate loan does make the calculation different. If you are concerned that rates may spike significantly, I think you still want to increase your cushion but whether you want to increase long-term investments depends on your risk tolerance. You are doing great! Congratulations. Check out the Dave Ramsey Baby Steps. He has advice for exactly your situation. The book Financial Peace covers the topic in detail. You have an Emergency Fund which is Step 3. Step 4 is investing 15% for retirement in 401k and similar. Step 5 is funding college if you have children. In Step 6, he advises putting any extra money towards the principal on your home. Owning your own home outright is a better goal than investing the money at a higher interest versus your mortgage interest rate. After your are completely debt free, then you can invest and give generously which is Step 7. Answering your question, push your emergency fund to 6 months, bump your retirement saving to 15% and put any extra money to your mortgage. I'm in my 40's, and fully paid off the mortgage early. My ex would have preferred that I'd given it to her as spending money instead. It can be said that since interest rates after year 2000 went down not up, I am a mug to have paid off early when perhaps I could have just bought more stuff like everyone else does. I looked at the 1970 to 1990 average interest rate; about 10%, and thought that it would be imprudent to have a big debt which would be crippling at 10 or 15% interest rates, so I paid it off while I could. A factor to consider is how you expect your own income to change over the next decade. If you work in shops, call centres, taxi driving, import warehousing, language translation, news writing, or anything which can be offshored or automated, then either the expectation of your salary diminishes towards the worldwide typical, or if it goes below £7.50 per hour typical then your employer goes bust. Or blags a subsidy. That is, I am a pessimist and would pay off early while possible. I don't know chinese for "he's not here" to say to the debt collector. According to Dave Ramsey you should pay off the house. What I've found is that I'm willing to work a lot harder at saving money to put toward the house when I have that specific goal in mind. If I were to put the money in the market instead then I would be less likely to make as many sacrifices and would inevitability end up putting less money away. To piggyback on a comment that @enderland posted, if you have some extra cash saved, something worth considering is to evaluate your current retirement accounts to determine future tax liability. In Canada, there exist Roth IRA-like Tax Free Savings Accounts (TFSA) which are pre-taxed (meaning that you pay all taxes up front when you deposit monies to this account rather than when you withdraw them during retirement after they have grown in interest). Depending on the type of account your retirement funds are currently held in, it might be financially advantageous of you to save your extra money in a short term savings account, transfer your current retirement savings from a post-tax account to a TFSA and use that extra money to pay off any immediate tax liability incurred as a result of the transfer. You will have to run the numbers yourself to determine if your retirement account setup, balance and interest justifies this route but given your age there is a fairly high chance that you can end up saving many tens of thousands of dollars in taxes that might be otherwise be due when you retire. Not the answer you're looking for? Browse other questions tagged canada mortgage or ask your own question. Do I end up richer paying down a mortgage or contributing to an IRA? I can completely pay off my mortgage early. Should I pay it off or invest?